From the big Redpoll invasion of 2013, a Common Redpoll sitting on a sunflower head in our yard. This week on Halloween, we had our first Common Redpolls since 2013. We’re at a part of the season that isn’t a lot of fun for a birder in South Dakota. As the calendar flips from October to November, we’re fully entrenched in the “dry season” for birding, where both bird diversity and bird numbers are far lower than in the warmer months. Most of the smaller water bodies in the area are starting to freeze over, and while there are still some waterfowl and gulls hanging around the open water in the bigger lakes, it won’t be long before they too depart for the winter. Nearly all of the insectivorous birds too have long left the state, leaving us with our typical winter mix of species. Dark-eyed Juncos are now found scattered throughout my yard. A welcome addition to an otherwise dreary winter in the yard, but…when the Juncos are around it’s a sign that winter is starting to arrive. In addition to my House Sparrow hoards, I’m also getting an occasional surprise sparrow species, such as the Harris’s and Lincoln’s Sparrows that have periodically showed up in the yard. I am now getting regular visits from three woodpecker species (Downy, Hairy, and Red-bellied), another nice presence during the winter months. But overall the species that dominates my yard right now are American Goldfinches. My wife bought me a huge, tall thistle (niger) feeder many years ago, and it’s always been a star attraction in my yard. The goldfinches will use it all season long, disappearing occasionally for a few weeks at a time, only to come back in full force and stay for long periods of time. Lately, as the weather has gotten colder, the finch feeder has been standing room only, with every available perch often full during the day. The goldfinches may not be in the brilliant yellow summer plumage, but the activity and quiet chatter is nice to have around. 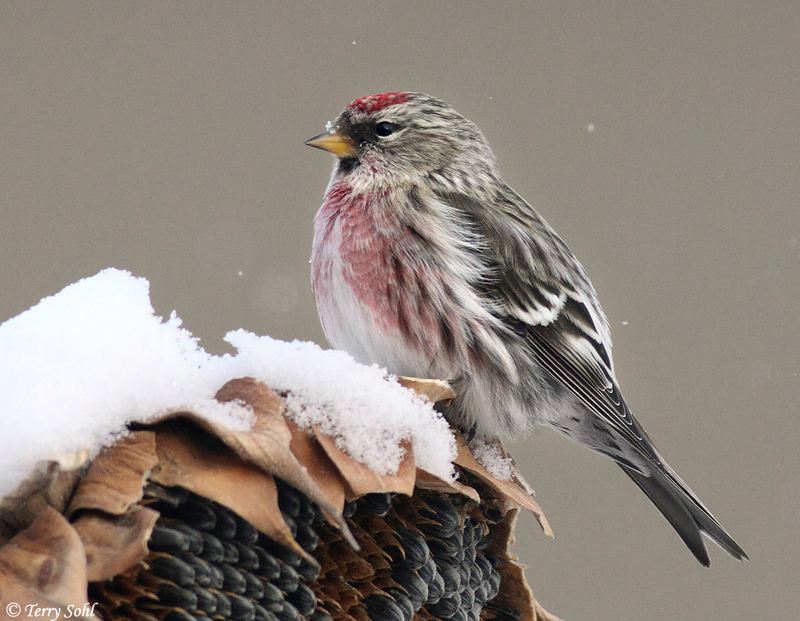 A Hoary Redpoll, a pale, beautiful, wonderful surprise later in that winter of 2013. The two that hung around my yard for several weeks are still the only two Hoary Redpolls I’ve seen in South Dakota. On Halloween this past week, I was working at home when I came downstairs to grab some lunch. As I was letting the dogs out into the back yard, I couldn’t help but notice some oddballs in the American Goldfinch hoard that scattered when seeing the dogs. Most of the flock landed in my very large River Birch at the back of the yard, and at first I thought the oddballs were just House Finches. But after the dogs finished their business and came back in, I was very pleasantly surprised to see a handful of Common Redpolls scattered in with the Goldfinches that were returning to the feeder. We’ve been in South Dakota for 24 years. 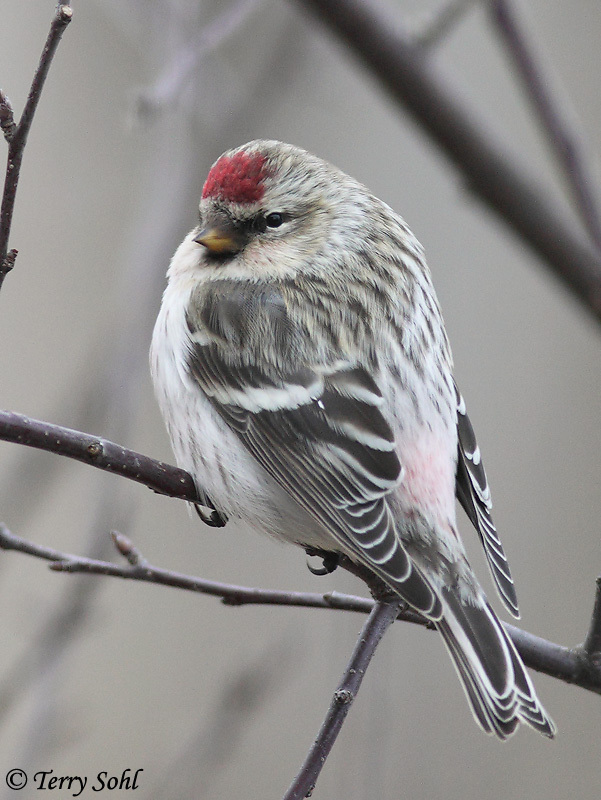 In those 24 winters, there have only been 3 occasions where I’ve had Redpolls in the yard. One of those occasions was a “one-night stand”, where a few were at the feeders briefly and then disappeared. But from January through March of 2013, my yard was inundated with Redpolls, to the point that Redpolls actually outnumbered the ubiquitous Goldfinches most days. It was a snowy and long winter (they all seemingly are), but having the Redpolls around made it seem a little less gloomy. Much to my surprise, the Common Redpolls weren’t even the best surprise that winter. One morning my young son looked out at the feeders and said “what’s the white one?” He saw a bird among the Common Redpolls at the finch feeder that was obviously different. I went over and looked out, and was rather shocked to see this wonderful, pale Hoary Redpoll mixed in with the Common Redpolls. A life bird, all from the comfort of my cozy sunroom window! We had one, and then two, Hoary Redpolls stay around the yard for several weeks before disappearing, along with the rest of the Common Redpolls. We haven’t had Redpolls in the yard since, until this Halloween day! I’ve got a glimpse of one Redpoll in the days since, as my finch feeder has returned to being dominated by goldfinches, but I’m hoping the Redpolls are still around, and plan on staying around for the winter. It would bring a VERY welcome splash of color and diversity to our limited suite of winter birds in South Dakota.